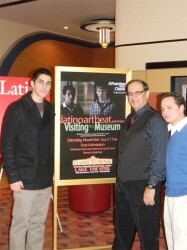 Latino Art Beat has its USA film festival premiere of its independent (‘indie’) film production of ‘Visiting the Museum’ a feature short created by current and former Latino Art Beat student filmmakers, from both the Chicago and Los Angeles programs of Latino Art Beat. The screening will be Saturday, April 20, 2013 at De Paul University, Auditorium of the College of Communications, 14 East Jackson Blvd. – Room LL102 at 1:00pm. The event is free. This Saturday’s screening of ‘Visiting the Museum’ is part of the 29th Chicago Latino Film Festival, which runs through April 25th. This year’s Student Segment of the festival is being presented by De Paul University in collaboration with Latino Art Beat. The Student Segment is devoted to present short films made by student filmmakers from various countries in Latin America and talented high school and college level students in the Chicago area. Latino Art Beat has encouraged young filmmakers by offering a film component in its national visual arts competition themed “What Hispanic Heritage and Culture Means to Me?” by awarding over $4 million in scholarship support to select winners of this milestone competition. This year’s competition deadline is May 29, 2013. Email latinoartbeat@hotmail.com for competition information.